Posts about Sun City Peachtree in Griffin GA on Small Town Retirement. Sun City Peachtree is a Del Webb 55 plus community just south of Atlanta Georgia. I visited Griffin GA for a couple of days recently and got a feel for what it might be like living there.Â It seems to be the all American small town, formerly a textile mill town, it is only 40 to 50 miles south of Atlanta but quite a bit more in lifestyle differences. Griffin has quite a few good amenities that would make it desirable for retirement.Â It has a lovely downtown with Hill street running down the middle. The City Hall and the Court Courthouse are right there also. Tim’s or Louise’s are southern food restaurants with affordable prices and good food. They are quite packed on Sundays after church lets out. All the chain restaurants are there too. Griffin also always had a good high school football team. The people are real people who are sincere, hard working and humble. 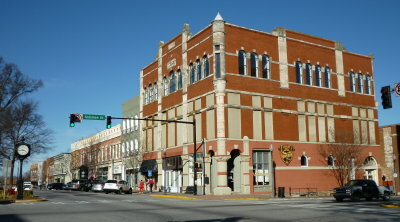 A lot of people do commute to the Atlanta area since there are not a lot of high paying jobs in Griffin.Â But there are sufficient stores and services, a large regional Griffin Spalding hospital, an experiment station of the University of Georgia, Elk Club, Moose Club and other clubs you would normally find in a small towns. Prices seems to be very reasonable on services like auto repairs, yard work, handyman services, etc. The housing is very affordable. I called about a 3 bedroom brick ranch with fenced yard in a nice subdivision. It was a HUD foreclosure listing for only $55,000. Anther person was renting a similar 3 bedroom, 2 bath brick ranch with fenced yard for only $650 month. Getting around is easy. The traffic is light. To get across town takes 5 to 10 minutes. So what is the catch?Â Well I think Griffin is a very local place. Many talk about Atlanta as another state even though it is very close. Many people live their whole lives in Griffin, some move to Atlanta and become professionals to move far away, but many stay put and work blue collar jobs.Â There is nothing wrong with that. There are a lot of people retiring in Griffin, but there have not been many moving to Griffin to retire. Until now. On the outskirts of Griffin toward I-75 that leads to Atlanta, Del Webb has built an active adult community, Sun City Peachtree it is called. It will have 3400 homes on 1,726 acres, a large golf coarse and a huge activities center that is already built.Â Last year I attend the Grand Opening and there were some very excited people there, a few from Griffin, and many from all over. As Bob Dylan sang, the times they are a changing.